Bikes get sold and transferred, so please call us to verify availability before you make a trip! We all love Truckaccino! If you are thinking about doing self-supported touring, then the Long Haul Trucker is your best choice, in my humble opinion. I have the blue one! You can see pics from the 9-day trip I took on it in New Mexico a couple of years ago at my personal web site, www.madzia.net. Kevin... I glanced at your site. That's AMAZING. That, to me, is what cycling is all about. I'm not all about the striving to get somewhere as quickly as possible on a fast bike (only sometimes). The best of cycling to me is seeing the world from the bike. That's why I did two tours in Europe. They weren't self-contained, though. But I wouldn't be opposed to that... definitely NOT!! Your photos are living proof as to why people should do it. 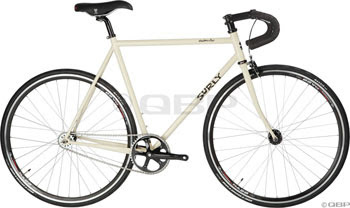 It says on the Surly website that the Cross Check also comes in Gloss Black... is this true? Yes! And we've also got a 56cm Black Cross-Check in stock! Yeah, but I dont want bar-end shifters... I think I am going to give you guys a custom job with my Cross-Check. Which should make the mechanics happy!